Bridge books often repeat the same ideas, and it is rare to find a volume that offers something new. 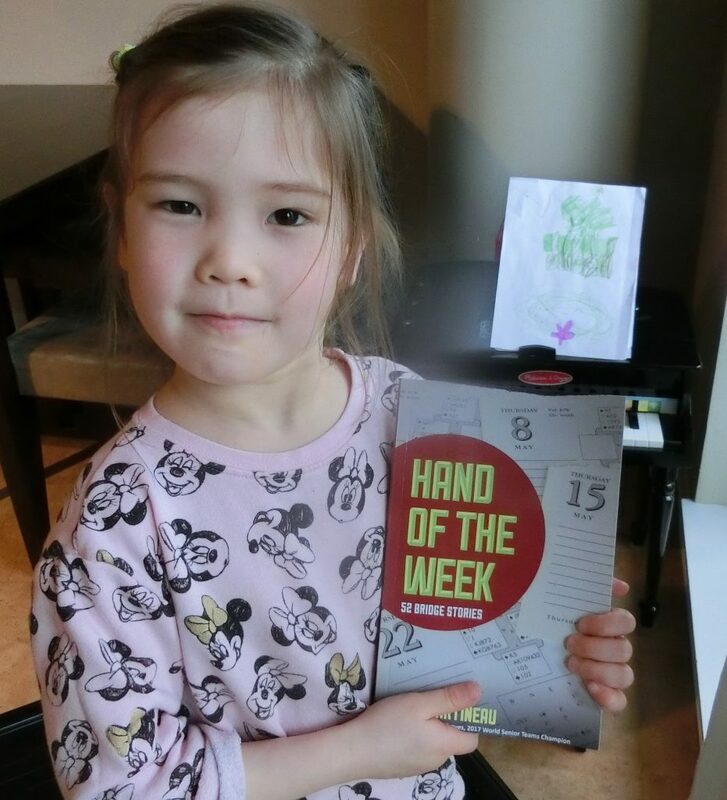 Hand of the Week, 52 Bridge Stories (Master Point Press, 2018), by Vancouver, B.C., bridge teacher Joel Martineau, definitely offers something new. For one year he reviewed his adventures at the bridge table each week and selected the most interesting hand. He then, originally for the assistance of his students, wrote about the hand of the week to point out what makes it worth our attention. Joel has produced 52 essays exploring some expected and some surprising topics. You will find much about bridge technique, how to play a better game, tips on how to be a better partner, how to make life easier for your partner and more difficult for your opponents, and how to be a better mentor. You will find some bridge history and some autobiography. This rich collection explores other less familiar themes, such as vocabulary as a technique for bridge improvement. Or, if you’re going to teach others bridge ideas, why do you not follow them yourself? Or, what do we truly love about this game? Picture a closet where you keep your clothes. If you toss your clothes in willy nilly and need to get dressed in a hurry, good luck. If instead you place certain items on certain hooks and hangers, and place specific underclothes and socks in certain drawers, and arrange shoes carefully, when you get dressed you can do so efficiently. Think of your brain as a closet where you store ideas, and vocabulary as the hooks and hangers. Learn the keywords and then store related knowledge under these terms. When wrestling with a problem in a pressure situation, recall the keyword, the hanger where you have stored pertinent ideas, and review previous examples. I teach bridge the same way. I want developing partners to learn the language of bridge rather than memorize rules. I urge them to build a Glossary, using their own words to define the concepts. Then if they spot a chance to apply the Law of Total Tricks in an auction, or try a ruffing finesse when declaring, or tap out declarer when defending, they can recall the ideas they have stored under the appropriate term. They can reach into the closet and ideally come out with the right garment, quickly. To this end, Hand of the Week contains a comprehensive Glossary as a starting point for the bridge student to stock his or her own closet with bridge technique. I reviewed all the deals and chose this 11-point part score, this smidgeon of larceny, for Hand of the Week. There’s still a grain of the little boy in me, the rascal who has always preferred the apple plucked from a neighbor’s tree to the apple bought at the store. A couple minutes later, as the contract unravelled and I went down, I began to reflect upon my approach to this hand, and to bridge in general. Bridge rewards effort and exposes inattentiveness. Those of us who train ourselves to work consistently excel; those of us who play too quickly bob along like flotsam. True reflection can be cruel. As I misplayed the hand last evening, I was disappointed with myself. This morning I am ashamed. How can I ask my students to stop and think when I play that quickly? I confess to a personal connection. Some time ago, Joel asked me to read a draft of one story (“The Impossible 2S Bid”) and let him know if I thought there might be a broader audience for a collection of similar chapters. Having been bested by Joel at the bridge table many times (and the recipient of generous, gentle, pithy advice about things I might have thought about to produce a better result) I happily read the chapter. I loved it and enthusiastically beseeched him for more. He accepted my offer to help proof the text (a ploy to allow me to elbow ahead of the rest of you in getting to read Joel’s work). There I had to focus on making sure that all of the 2’s and 3’s in the hand diagrams were in the right places rather than on the sheer joy of the book itself, but found myself, time after time, engrossed in the profound topics Joel canvasses. I recommend this as a book for all players striving to improve their bridge, step by step, advancing from intermediate player to higher standards. Newer players will find some of the topics challenging, but it’s never too soon to encounter the ideas that underlie becoming a truly strong player (and to begin developing your bridge vocabulary). As is the case with all great bridge books, the lessons cannot be absorbed at a single sitting, and must be revisited. I look forward to returning to this book time and again. Expert players may find much of the technical side of HOTW familiar, but it would be a mistake to skip this book thinking that you already know it all, because you will miss out on a great and thoughtful read as well. Master Point Press is the publisher of Hand of the Week, and many other admirable books on bridge. It has a popular series where 25 ideas are covered in a book: 25 ways to be a better defender, 25 bridge myths and so on. Joel has gone them 27 better and given you 52 stories, packed with ideas to think about. Put yourself in the hands of this skilled raconteur. 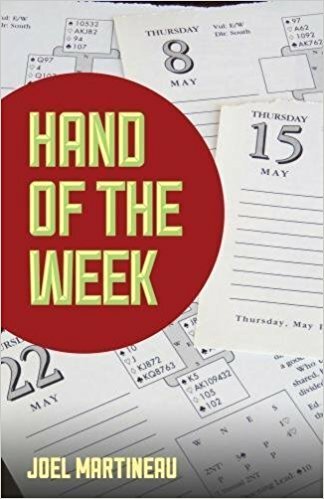 Hand of the Week, 52 Bridge Stories, Joel Martineau (Master Point Press, 2018) $19.95 (US) $23.95 (Can). Photo: Joel’s elder daughter, Michelle, holding her father’s book.